The Patriarch gives a response to those who criticize the Patriarchate for participating in ecumenical dialogue. A powerful message was sent to multiple recipients within all the Churches today by Ecumenical Patriarch Bartholomew regarding the issue of ecumenical dialogue. Addressing Patriarch Neophyte of Bulgaria, who is making a peaceful visit to the Ecumenical Patriarchate, Bartholomew said among other things that he is neither betraying Orthodoxy nor is he supportive of ecumenistic concepts, as they say. “Through this strategy we are not betraying Orthodoxy, as criticized, nor do we support ecumenistic concepts, but we proclaim to the heterodox and to all the truth of Orthodoxy,” he said characteristically. “We do not aim, as it is written in Bulgaria and elsewhere, towards the creation of a commonly acceptable ‘conglomeration’ of beliefs. That is, we are not pursuing through the so-called ecumenical movement the acceptance of a ‘Christian syncretistic confession’, but a deepening in the Orthodox Christian faith and in societal cooperation with those who invoke the name of Christ,” said Bartholomew. The Ecumenical Patriarch did not omit to refer to the serious problem in the relationships between Orthodox Churches, problems which have often hindered the process of convening the Holy and Great Synod, which will be the gathering of all Primates to discuss issues of common interest. “Lately, however, the conditions have improved and the desire for more unity and cooperation has matured. This has helped a lot, despite humanly unpredictable and unknown factors, in preparing for the Holy and Great Synod of our Orthodox Church; the preparation of which, even when there have been cases of disagreement, has shown and proved the desire to surpass difficulties and clinging to indestructible and sincere spiritual ties, which link us inextricably as individual Orthodox Churches towards one another and towards the first among these – the Ecumenical Patriarchate,” said the Patriarch. Mr. Bartholomew stressed that local Orthodox Churches are united around the common Chalice, and various disagreements do not break their unity. 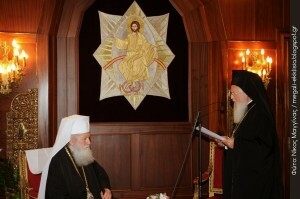 “Therefore, it is important that the effort to endeavor to bridge the differences between Orthodox Churches is not an effort associated with already achieved steadfast unity, but a deeper, further and consolidated effort, to achieve a uniformity at the possibility in overcoming various emerging issues,” he said further.